Proportional representation is any voting system designed to produce a representative body (like a parliament, legislature or council) where voters elect representatives in proportion to our votes. Why is proportional representation the solution? A proportional voting system solves many of the problems inherent in the first-past-the-post system. First and foremost, it would produce fair and accurate election results, with each party winning seats proportional to their vote count (e.g. 40% of the votes means 40% of the seats). 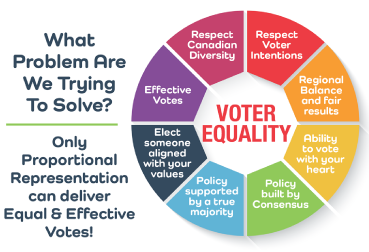 Equally important, proportional representation enhances voter equality, granting citizens the power to elect a representative that shares their values. Albertans supporting the Progressive Conservative Party in a traditional New Democratic Party stronghold, or vice versa, would not be “wasting” their vote. At the federal level, this means non-Conservative supporters in Alberta can be adequately represented in Ottawa. When elections are more proportional, the resulting coalition or governing group represents a true majority of voters. It requires governments to compromise and build consensus, which creates stability. More than 80 countries use elements of proportionality when electing their national assembly, including most long-term democracies, most European countries, and most of the major nations of the Americas. New Zealand, as a former British colony, changed from first-past-the-post to the mixed-member proportional system, holding its first election under the new system in 1996. Voters confirmed their support for the system in a 2011 referendum. Canada, also a former British colony, can follow this example and implement meaningful change to our antiquated voting system.